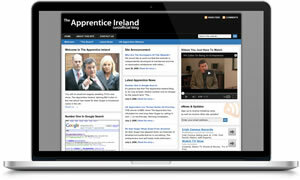 Another pet project of ours, we built The Apprentice Ireland blog when the new TV3 series was being launched. The aim was to gain exposure to our web design services via the footer link. Even though the website generated a large volume of visitors, our interest in the project waned over time as other priorities rose in importance. This meant we didn’t keep the blog as fresh and up to date as was required to engage new visitors. However, we were able to generate some additional revenue from the Adsense ads and Amazon affiliate links scattered throughout the site.